An Armenian American skier hopes to represent his historical homeland in an alpine ski slalom competition during next year’s Winter Olympics in Russia. Arman Serebrakian, the four-time National Collegiate Athletic Association skiing championship top-10 finisher for Colorado, is taking a respite from his postgraduate medical studies at Temple University in Philadelphia and for the next several months will be focusing on becoming a doctor of downhill ski racing, writes Marin Independent Journal (marinij.com). The son of Armenian immigrant parents, Serebrakian, 26, has a dual-citizenship and accepted an invitation from the Armenia Ski Federation to join its national ski team for the 2014 Games in the Russian resort town of Sochi, the website adds. Interestingly, Serebrakian’s sister, Ani-Matilda, made the Armenian national ski team and competed at the 2010 Olympics in Vancouver, although without success. Both her attempts in ladies’ slalom were disqualified by judges and she went unplaced. None of the four Armenian athletes competing in slalom and cross-country skiing made a decent finish at the Vancouver Games. The fact that Yerevan is practically at walking distance and closer to Sochi than most Russian cities. Has anyone seen or heard, if and what Armenia is planning? How far is Yerevan from XYZ….? Why Doesn't Armenia Have Figure Skaters in the Sochi Winter Olympics? Due to a lack of facilities and funding, professional Armenian figures are forced to train abroad and in conditions that are unequal to their counterparts in other countries which might be part of the reason for their poor track record last month. When Armenia's representative finished last at the 2014 European Figure Skating Championships in January in Budapest, some fans were forced to reevaluate the potential of Armenian figure skaters. When it became known that Armenia won't have a representative in the figure skating competition of the Sochi Winter Olympics, which begins today, social networking sites were buzzing with questions such as "Don't we have any good figure skaters?" and "Is figure skating as a sport neglected in Armenia?" "We have good figure skaters. For example, we had a good contender for the Olympic Games, Arina Petrova. In order to participate in the championship, she had to be a citizen of [the Republic of] Armenia: we didn't manage to get a passport in time," explained Figure Skating Federation of Armenia President Melanya Stepanyan. "Our kids are really good. We train for two to three months, then they go to competitions, and they do well." As for why Armenian figure skaters train only for two to three months has to do with problems that began five years ago. The only figure skating school in Yerevan's Shengavit administrative district has been in poor condition for years. The skating rink has not been operational since 2008, and there aren't sufficient conditions to hold classes. A professional figure skater has to train for 11 months on ice, whereas Armenian figure skaters train on ice for only 4 months at the Karen Demirchyan Sports and Concerts Complex or the temporary skating rink at Swan Lake. So how are they able to participate in competitions and win places under these conditions? According to the federation's president, members of the national team and Armenia's leading figure skaters mainly train abroad. For instance, Slavik and Sargis Hayrapetyan train in Riga; Anastasia Galstyan and Izabela Davtyan, in Moscow. "In any case having our own skating rink is a necessity," she says. Yerevan City Hall promised to renovate the school 5 years ago, and during the Yerevan Municipal Council elections last year, the Republican Party of Armenia in its election campaign promised "to implement a program to develop figure skating and construct a corresponding sports school." Asked by Hetq why this promise isn't being fulfilled and what steps have been taken, a Yerevan City Hall representative said that the issue of reconstructing the organization's offices and sports base is included in the annual and quarterly programs. Preparation for the first phase of reconstruction is already underway: a tender for reconstruction and drawing up the drafts of the dance choreography studios, offices, and changing rooms has been announced. But why do athletes or coaches need changing rooms and offices if the skating rink and, to a great extent, the school won't be in operation? As for reinstating the skating rink, the city hall representative said initially they planned to acquire a silicone rink, but later, considering experts' opinion that silicone has harmful effects, they decided to restore the rink with natural ice. This, in turn, increased the estimated amount of the project, and the need to find investors arose, for which "city hall is engaged in the relevant work." Basically, the municipality needed the full five years to realize how dangerous silicone is. As for how many years will be required to locate investors, it's hard to say. Not having a skating rink of our own and training abroad comes with its own set of problems. According to Stepanyan, Armenian figure skaters compared to others experience unequal competitive conditions, as training abroad requires some finances: "For example, Slavik Hayrapetyan, no matter how much he trains in Riga, has the opportunity to train [only] in the morning for two hours and that's all he can't train for 8 hours a day like Plushenko. He's not as financially secure." According to her, the 9 million AMD (about $21,964 USD) allocated to the federation annually from the state budget is not enough to cover the athletes' expenses. With this amount of money it's possible to participate in at most two international competitions. "Figure skating is an expensive sport; I barely manage to distribute the money. Participating in competitions, the current expenses, and the necessary costumes require a lot of money," Stepanyan confessed. The federation president said she doesn't stop looking for sponsors for the figure skaters. The remaining costs are covered by individuals, mainly the athletes' parents. Figure skaters participating in international competitions abroad mostly cover their own expenses. "No investment is made in winter sports. What do they invest in, anyway?" remarked Stepanyan, even adding that she intentionally chose a financially secure athlete to participate in an international competition once so that she "doesn't beg for money from the state." To what extent is the National Olympic Committee of Armenia (NOCA) interested in financing the Figure Skating Federation of Armenia, developing figure skating as a sport in Armenia, and sponsoring athletes? By Stepanyan's account, the Olympic Committee financially assisted athletes, though she's never personally appealed to the Committee. Head of NOCA's press service Yuri Aleksanyan, in conversation with Hetq, remarked: "The Olympic Committee's president might not give a single cent at all to the Figure Skating Federation." Aleksanyan said there's no fixed amount as to how much the Committee has to give to whom. "You want to be useful to figure skating, put down your money; if you can't, don't assume the position," he said, referring to the Figure Skating Federation of Armenia president. Even the state, Aleksanyan said, might not finance the Federation in this case as it's a non-governmental organization. "For example, I'm the president of the country; I give money, so you can train where? If you don't have ice, I give the money, so you can take it where?" asked the National Olympic Committee of Armenia spokesperson, justifying that he's not speaking about anyone in particular. Considering that for example, wrestling, boxing, and weightlifting get around 200 million AMD ($488,079 USD) each from the state budget annually, while figure skating gets only 9 million AMD, one is left with the impression that the state doesn't intend to develop this winter sport in Armenia. Responding in writing to Hetq, RA Deputy Minister of Sport and Youth Affairs Nazareth Mnatsakanyan wrote: "Yes, we have great successes in some sports, especially in freestyle and Greco-Roman wrestling and sambo. Undoubtedly, maybe not a lot of money is required to develop these sports and in honor of some sports federations, they try to find sponsors on their own, who then make large financial investments." This year, 929 million AMD ($2,267,130 USD) 9 million of which, as previously mentioned, is for the Figure Skating Federation of Armenia was allocated to national sports federations. Within the scope of state assistance program the amount of financing was decided according to the federations' compiled applications and plans for the year. In his response, the deputy minister did not exclude the possibility of a redistribution of financial allotments during year by providing additional funding to federations that produce good results at the expense of those that don't. That is, based on successes this year, there would be a redistribution of the third and fourth quarters' finances. At the end of his letter, the deputy minister made a remarkable observation: "By the way, he who wants to work, works; he who doesn't, searches for reasons"
P.S. Beginning in 1998, Armenia participated in the figure skating competition in the Winter Olympics the same year in Japan (the pairs Maria Krasiltseva and Aleksandr Chestnikh, and Ksenia Smetanenko and Samvel Gyozalyan); in 2002, in the US (Julia Lebedeva, and the pair Maria Krasiltseva and Artem Znachkov); and in 2006, in Italy (the pair Anastasia Grebenkina and Vazgen Azrojan). Edited by Arpa, 07 February 2014 - 09:27 AM. Today the Armenian skiers were supposed to run. Has anyone heard how they did? Specially when we dont see those bastards on the east and the west. Sochi, which underwent multi-ethnic colonization in the 19th century, may technically be all-Russian now, but its food remains diverse, the CNN writes. 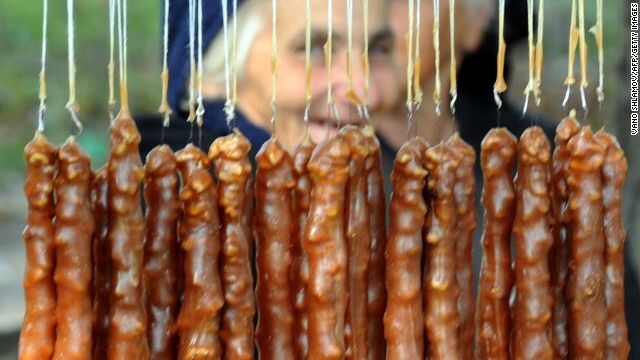 With Armenians accounting for 20% of the city’s population, and close proximity to Georgia, Sochi offers an impressive sampling of cuisine beyond the dill and sour cream of traditional Russian fare. You’ll find authentic Armenian at kitschy Amshensky, part of the largest private museum of Caucasian artifacts and history. Chefs make wood-fired lavash bread and clay-pot stews. A Georgian favorite is Ne Goryuy, known for its chakhokhbili – chicken in garlic sauce – and its quiet location off the seashore. Ands see # 175 here. Edited by Arpa, 09 February 2014 - 01:27 PM. Watch out for the PAGAN Canadians! Animal in action! Mr. Hayvan this is not turkey! Head of Corendon Dutch Airlines Atilay Uslu, a Turkish by nationality, said he was detained near the Sochi Olympics for urinating on a fence outside President Vladimir Putin's villa, UPIreports. Uslu said he was out with a friend Sunday night celebrating the Olympic performances of Dutch skaters when he stopped to urinate on a fence and quickly found himself surrounded by about five Russian soldiers, DutchNews.nl reported Monday. Uslu said the soldiers were talking about a "one way ticket to Siberia and asked me if I had not seen the security cameras or knew that it was Putin's house." Uslu said he was released after about an hour. Edited by Yervant1, 11 February 2014 - 10:50 AM. Olympic city of Sochi, chelovek-online.ru reports. Olympic Games. The program includes works by V. Sharafyan and Komitas. To those children who posted the insults, grow up it's only a game! Guess what the real game today, you lost again. (This is in response to that one particular twitter). When the Canadian women's hockey team came from behind to first tie up the final game, then beat Team USA for the gold in overtime, hockey fans on Twitter got a little overheated - and classless. Avert your eyes if the indignant use of profanity offends you but for a short while Thursday afternoon, the hashtag #F***Canada was trending on Twitter. Yes, fans of the U.S. team were so upset with the skills of our gold medal-winning women, they decided to heap their scorn on our entire country. A tweet from user @_Kalls read: "If you aren't upset about this game, you can just go ahead and pack your bags and move to Canada because we don't want you. #USA #F***Canada"
That one earned plenty of "favorites" and retweets - and some fairly angry replies. @UMDHumor seemed to suggest the women's game was really just a warm-up for the men's game: "The real hockey game is tomorrow. #F***Canada"
And @KevinTurley vowed to take out his anger on his pancakes: "Just threw out all of the MAPLE syrup in my house #f***canada"
Spitting vitriol through 140-character tweets is nothing new, but the anger piled on Canada stunned more than a few Twitter users. Some Canadians reacted with their own indignation. While others reacted with trademark Canadian humour. "To the #F***Canada crowd. Listen, our healthcare is free, we are great at hockey & we let people marry who they love. Also. Poutine," wrote @GregPoirier in a tweet that was retweeted several times. User @ashleybrett wondered if perhaps he had misunderstood. "Ohhhhh they meant #F***YeahCanada," he said. Still others urged hockey fans to pull it together and just calm down. "#F***Canada is trending? Stay classy USA," wrote @MelanieDias15. That sentiment was retweeted and favourited several times. "If #Canada's Women's Hockey Team had won Silver, we would be celebrating, not being mean-spirited. #F***Canada is a hashtag for #SoreLosers," opined @Nat_Rea. The nail-biting women's final was a hot topic throughout Thursday afternoon. Even the popular @TweetofGod account chimed in. "I have to help Canada at hockey because it's all they have up there besides civility and poutine." Even Prime Minister Stephen Harper and U.S. President Barack Obama got in on the rivalry, albeit on more friendly terms. Following the women's hockey win Thursday, Harper took to Twitter to remind Obama that he owes him a case of beer. The pair bet two cases of beer - one for each Canada-U.S. Olympic hockey matchup - at the leaders' summit in Mexico this week. With the Canadian men's hockey team preparing to face off against the U.S. team in the semifinals later Friday, prepare for more of the same. Some Twitter users have already created a hastag to declare which spoils should go to the loser of today's game: #LoserKeepsBieber. And at least one bar owner in New York State is taking out some early revenge.. on Canadian beer. The owner of the Amherst Ale House tweeted Thursday night that it won't be serving any Canadian beers during the men's semi-final game. "This is a patriotic matter, thanks for your understanding," the bar wrote. I am so embarrassed and ashamed to write this. Americans are such sore losers. The above seems like it was written by 8 year old spoiled and potty mouthed brats. But the adult Americans are no better, be they citizens, politicians or journalist. Ever since the beginning of the Winter Olympics, even months before, all we have heard is comments of doom and gloom, how the Olympic village was being built so shoddily, terrorists and non-functioning toilets. It continues even today. Americans must be so disappointed there were no major terrorist incidents. Is the Cold War over yet? Too bad it did not advance to a Hot War. Americans are so warlike, they wish and pray for it day and night. Look at how many declared and undeclared wars they are involved in, all the way from Afghanistan to Zimbabwe, including Syria et al. THE BOMBS BURSTING IN AIR!!!??? Will the US media air the Closing Ceremonies or is it too painfully embarrassing now that they trail behind Russia, Norway and Canada?